The practice of stormwater management is constantly evolving. 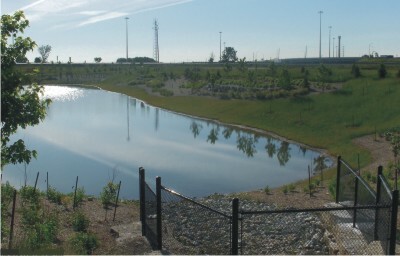 In Ontario, the management of urban stormwater for the purpose of flood control has been practiced since the 1970’s. In the early 1990’s stormwater management also became recognized as an important means of improving water quality and reducing the discharge of contaminants to our lakes and rivers¹. Since then, the practice has focused largely on centralized stormwater detention, also known as end-of-pipe stormwater treatment. While the past several years have seen a shift towards low impact development – which is focused on decentralized source controls, and increasing infiltration and evapotranspiration – conventional measures like wet ponds remain an important component of stormwater management planning. Conventional controls that detain stormwater, like ponds, constructed wetlands, and detention chambers, function to protect receiving water bodies by attenuating peak flows, controlling stormwater release rates, and promoting the settling of sediment and associated contaminants. By detaining large volumes of water, they help to mitigate flood risks and improve resiliency to large rain events – one of the primary goals of water management in the Greater Toronto Area. Select a category on the right side bar to learn more about conventional stormwater management measures. ¹Ontario Ministry of Environment and Energy and Ontario Ministry of Natural Resources, 1991. Interim stormwater management quality control guidelines for new development.